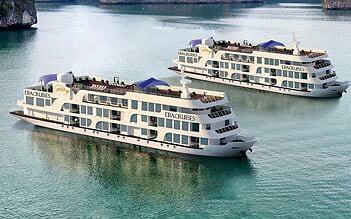 Era Cruise is a luxurious brand-new steel cruise which ensures the aesthetic makeover and safety for guests. For the first time in Halong Bay, the double bottom deck's technology is applied with two watertight layers on the bottom of our cruises, providing an extensive safety measure forming a redundant barrier to seawater in case that the outer bottom is damaged and leaked. Moreover, Era cruise is confident to catch your eyes at the first impression from the aesthetic outlook to the luxury interiors and architecture design with Galaxy Coffee Lounge at the welcoming entrance, Skyline Bar and Starry Mini Cinema for your utmost enjoyment, and outstanding Mini Golf course at the top deck with marvelous bay view, and the Medical care center for emergency case.